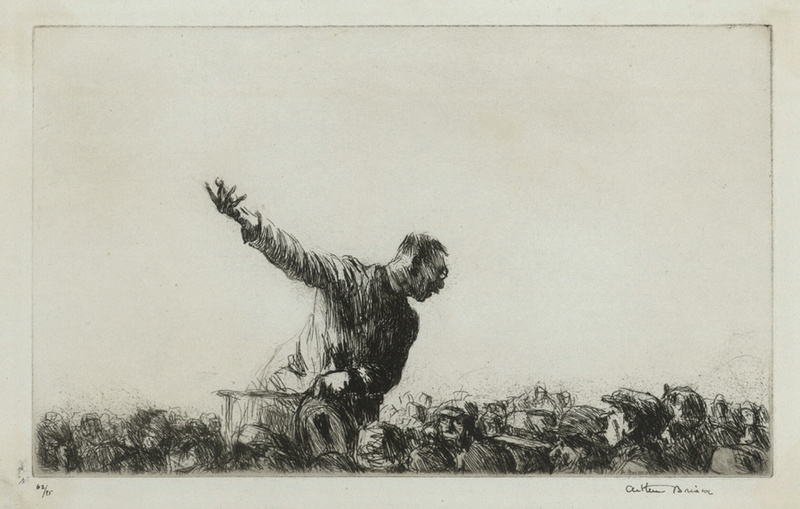 This is an original etching and drypoint by British artist Muirhead Bone. 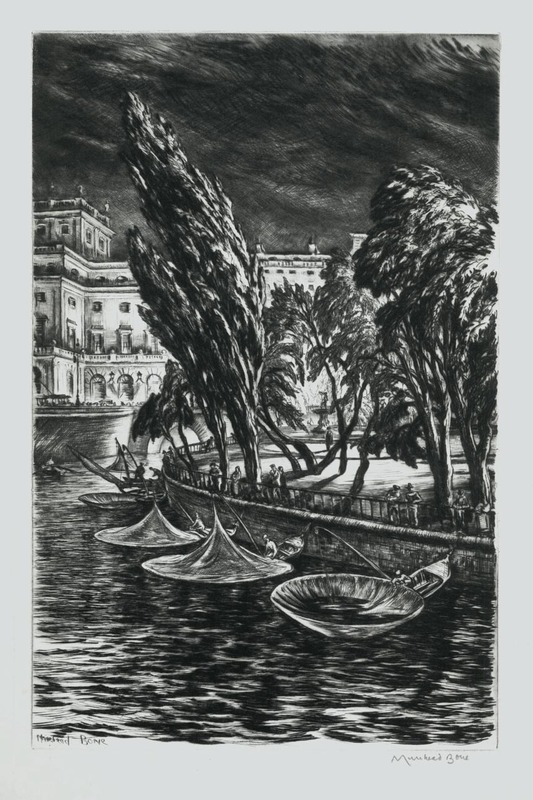 The title is: "Windy Night, Stockholm", it was created and printed in 1935 in an edition of 93. The image measures 11 7/8X7 5/8 inches. Very fine condition, printed on a medium weight wove type paper. This image appears in the Dodgson catalog as image number 457. 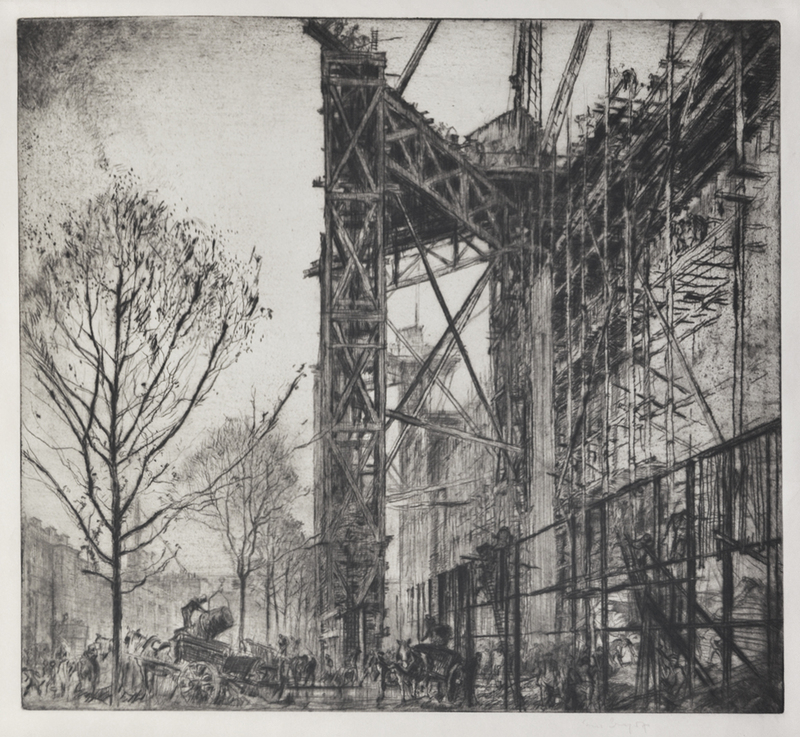 The image also appears in the Guichard Book, "British Etchers 1850-1940. A Regatta on the Grand Canal. This is a large drypoint etching by British artist James McBey. 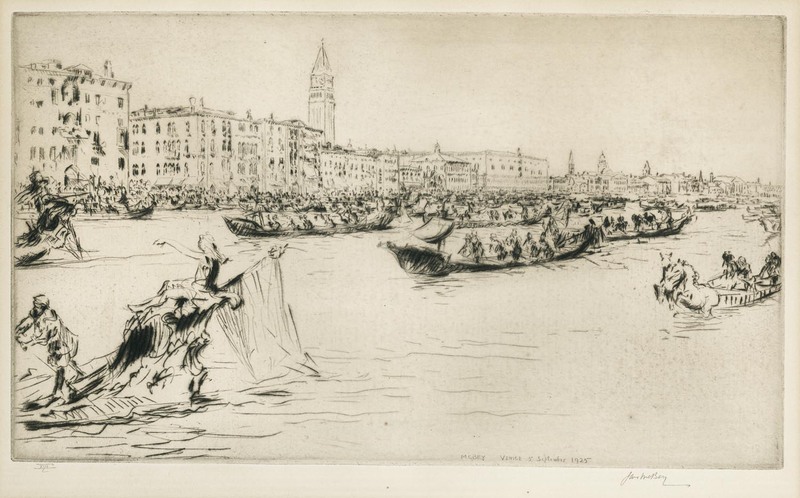 It is titled: "A Regatta on the Grand Canal". 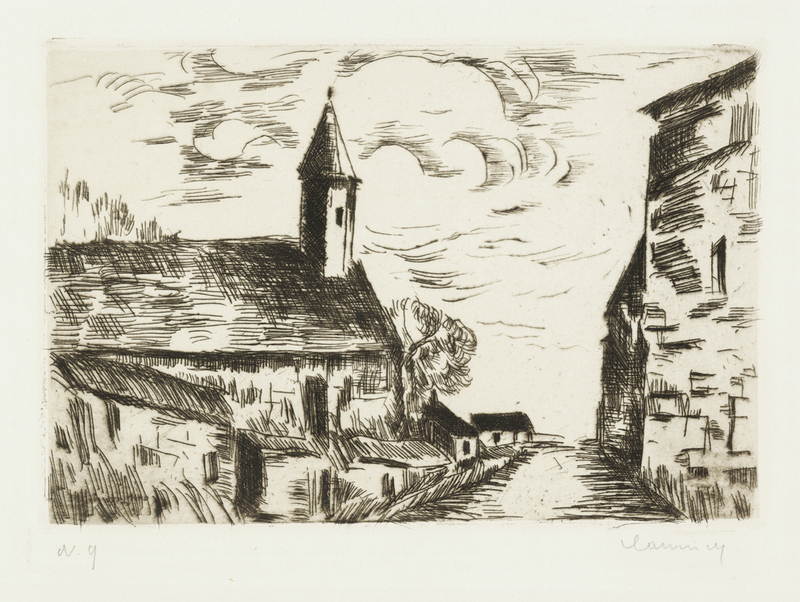 This etching was created and printed in 1930 in an edition of 89, this one is impression number 42. The image measures 8 7/8X15 3/8 inches, printed on a wove type buff toned sheet.It is hand signed in ink in the lower right border. A fine impression, well inked. This image appears in the Hardie catalog as image number 248. 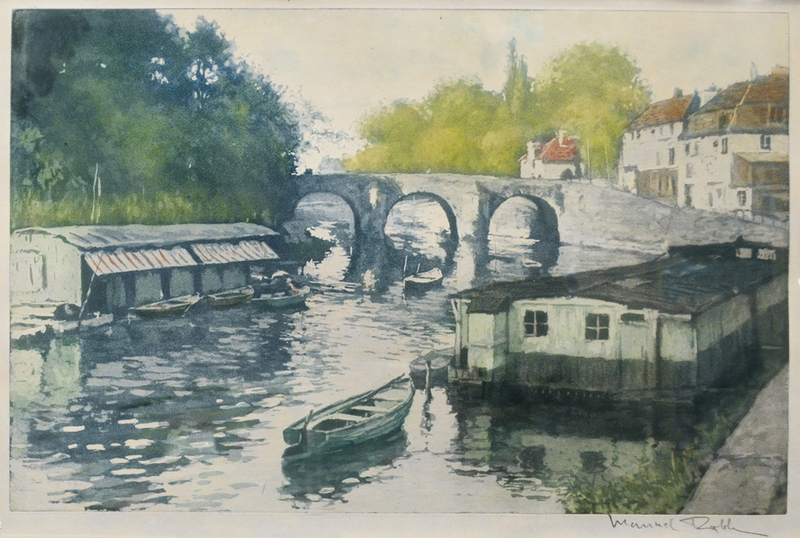 This is an original hand signed color aquatint etching by French artist Manuel Robbe (1872-1936) The title of this etching is: "Le Pont de L'Isle Adam" it was created and printed in 1927 in an edition of 100. The etching is pencil signed in the lower right. 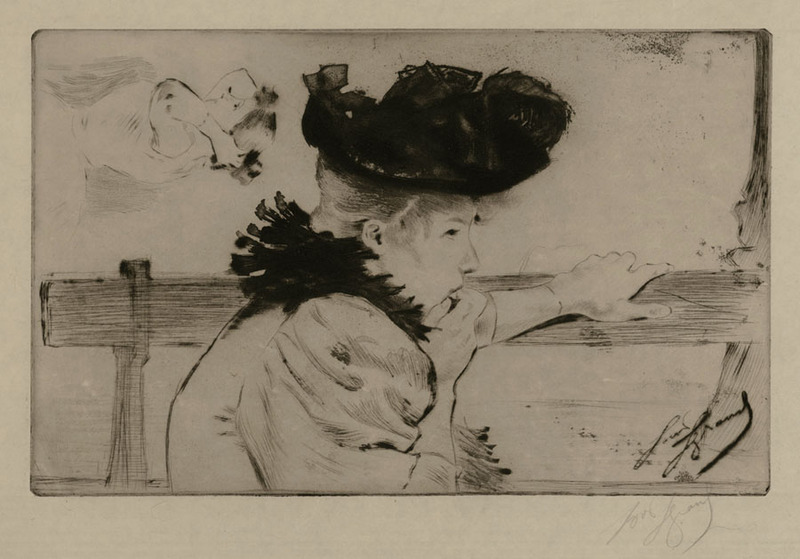 This etching was formally sold by Merrill Chase galleries in Chicago. The image mesures 13 1/2X21 inches. It is in a fine 24X30 inch gold frame with the Merrill Chase labels on the back.A fine impression, Robbe studied at the Academie Julien and the Ecole des Beaux Artes in Paris. 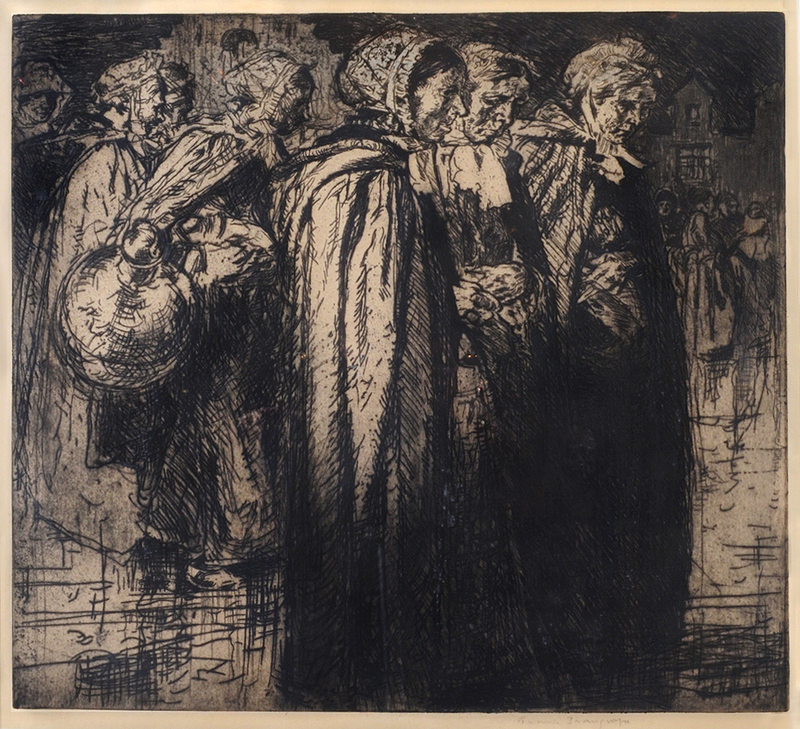 A large drypoint etching by Sir Frank Brangwyn. Plate measures 19 x 20 3/4 inches in a 26 3/4 x 28 inch frame. The plate was etched on the spot. C 1906. Catalog: FASL 65. A somber and well inked print with a rich drypoint burr. A rare print! 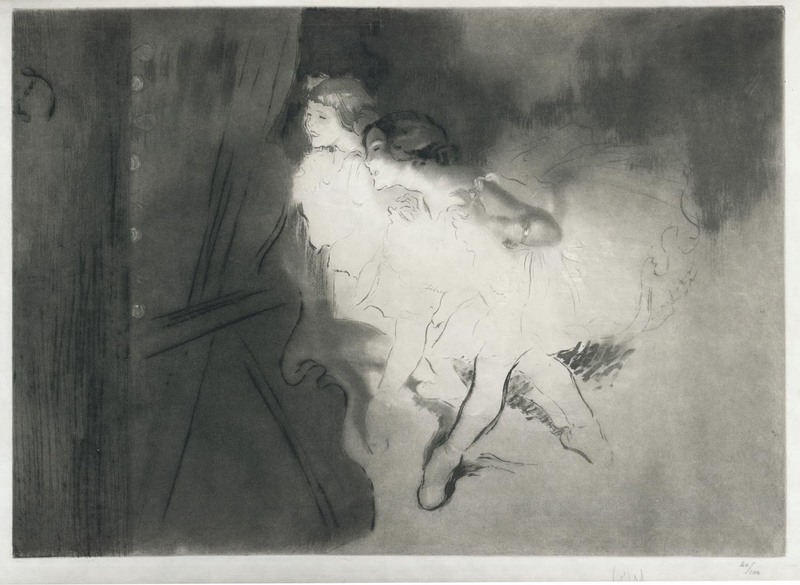 Etching, image size 3 3/4 x 6 1/2 inches, Flammarion 135, 1927, part of the Visage des Maison series, pencil signed. 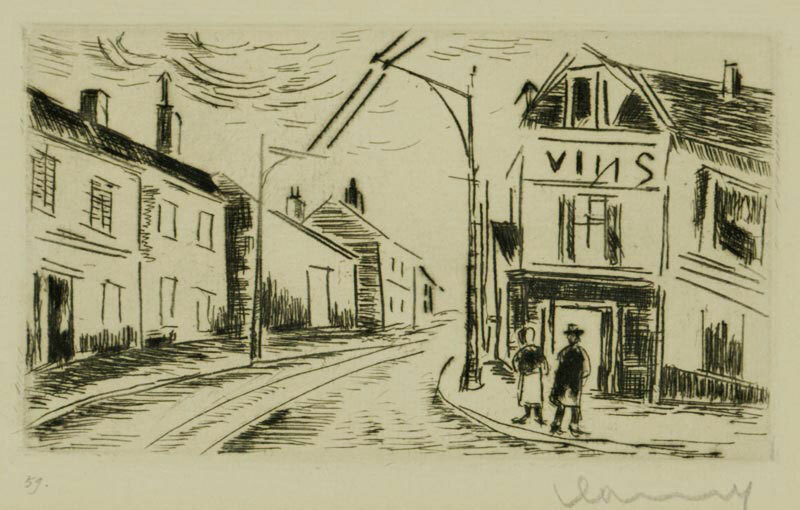 Drypoint from 1932. Signed in ink below the image. Inscription in lower right reads: "Impression selected for my friend Harold Bailey - E. Blampied" 1/100. Plate size measures 8 3/8 x 11 7/8 on 11 1/2 x 17 1/4 inch laid type paper. A richly inked, atmospheric print. 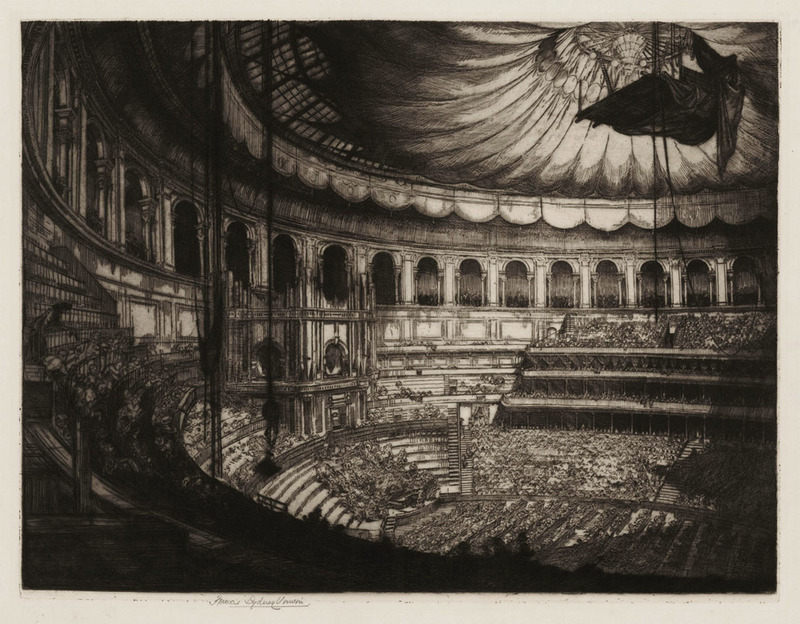 This is a very rare etching from a scarce, unpublished plate by Francis Sydney Unwin. The image size is 12 1/8 x 16 inches, 1916, pencil signed; a richly inked impression on a fine cream colored Japan paper. Unwin studied at the Winchester School of Art and the Slade School; he traveled extensively throughout Europe and spent several months in Egypt drawing the tomb interiors for an archaeological expedition. He then settled in London, becoming known for his landscapes and remarkable interior architectural views, such as this finely detailed image of the Albert Hall. Unwin died at the age of 40, after suffering from tuberculosis for much of his adult life. 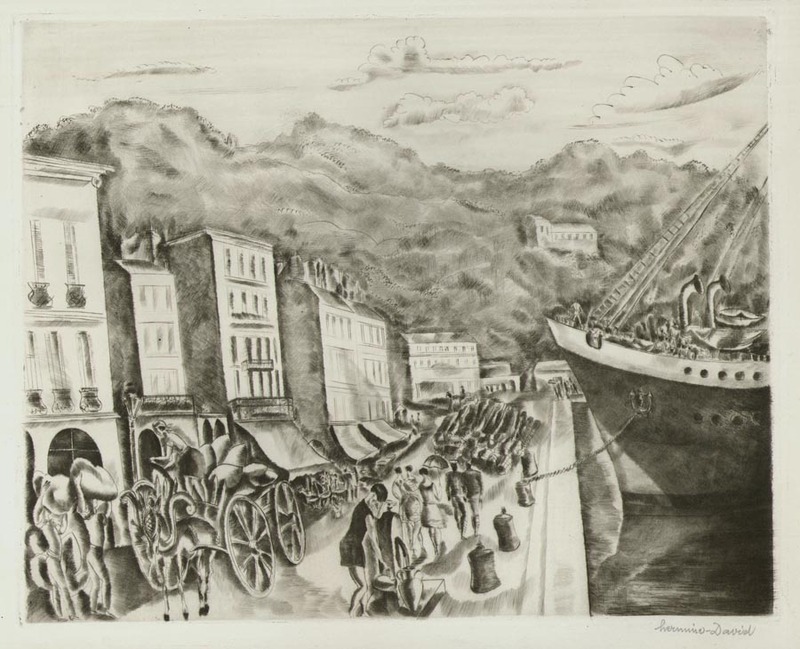 Etching, aquatint and drypoint, image size 7 1/2 x 12 inches, 4th state, "Louis Legrand" pencil and plate signed l.r., Arwas A74. 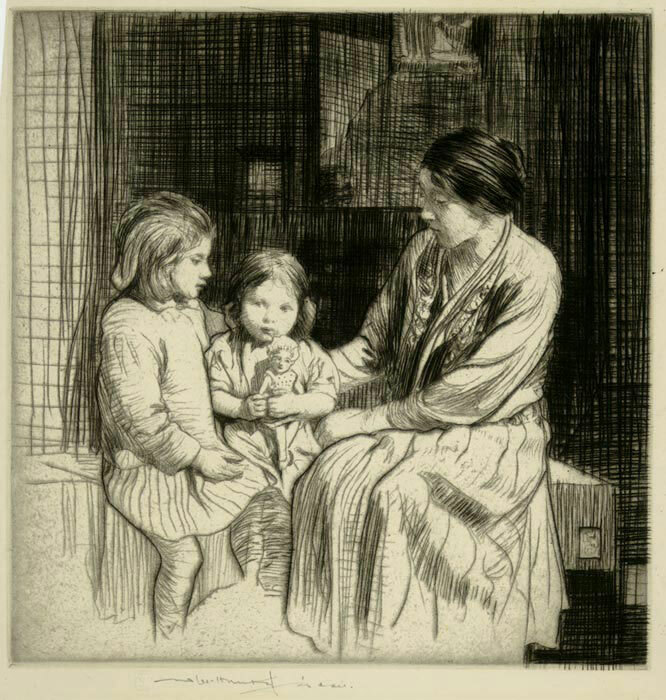 A richly inked drypoint from 1919. Catalog reference: Gaunt 245. Edition of 54. Pencil signed in the lower right. Plate measures 19 x 20 3/4 inches on 24 1/2 x 29 1/2 inch wove type paper. 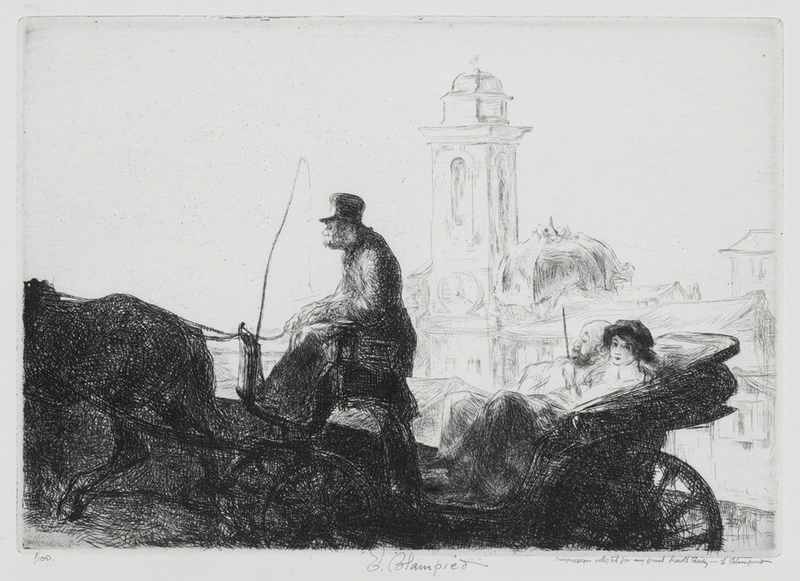 Sir Frank Brangwyn was one of the most important British artists of the early 20th century. A member of the Royal Academy, the Royal Watercolor Society, and the Royal Society of British Artists, he was knighted in 1924. Colored softground and aquatint from 1925. Numbered 65 in an edition of 300. Catalog: Novak 432. Pencil signed in the lower right, numbered in the lower left. Plate measures 11 5/8 x 15 1/4 inches on 15 1/8 x 19 inch watermarked wove type paper. An atmospheric etching that captures the bleak weather with splashes of color. F. Simon was born in Bohemia, now the Czech Republic. He studied at the Academy of Fine Arts in Prague and traveled extensively throughout Europe, as well as Asia and the U.S. He lived in Paris from 1905-1913, then returned to Prague to teach at the Academy of Fine Arts. 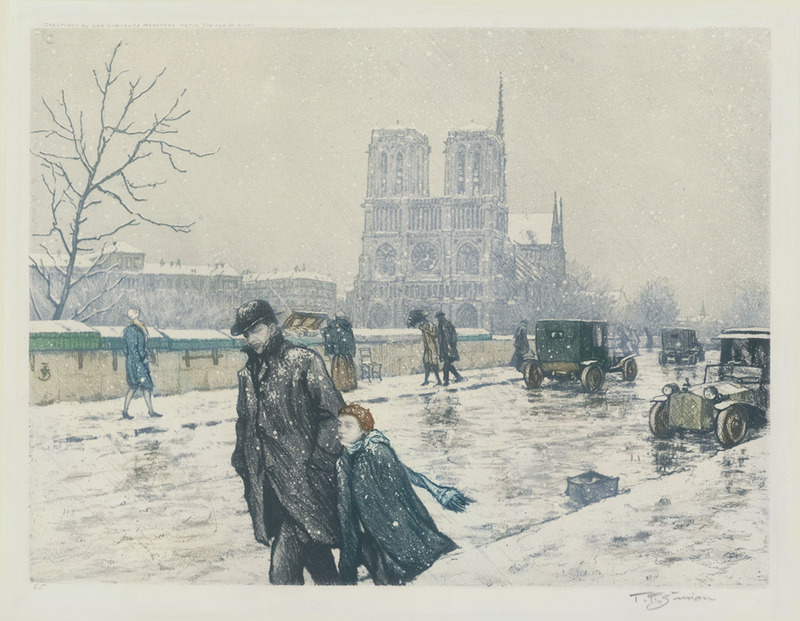 Simon was an exceptional painter and printmaker, and is best known for his atmospheric color etchings and aquatints, such as this wintry Paris scene.